If you feel strongly about empowering girls to be strong, courageous and independent, then you may enjoy this new Inspiring Children’s Book Find, The Super Duper Princess Heroes: How It All Started. Author Sanjay Nambiar, who also wrote the series A Little Zen for Little Ones, tells me the purpose behind his new book. I want to break down the existing princess paradigm of weak female role models and replace it with something more empowering. Girls should know that they don’t need a prince to save them, but rather they can save the prince! Three girls stumble upon three magical tiaras that transform them into Super Duper Princess Heroes. In order to keep their new magical powers, however, the girls must help others, work together as a team, and always be humble about their abilities. The only boy in the story, a young prince, held some old fashioned assumptions about girls and what they might expect from him. Although the delivery may have been a bit strong and sassy, the girls’ message was loud and clear. Girls are just as capable of “saving the world” as boys. The girls weren’t there to marry the prince, they were there to help him. You might think of this book a little like The Power Puff Girls meet Buddha wisdom. The girls are strong (without violence) AND girly (without pink) AND kind AND helpful AND they know how to work together to solve a problem. My kind of girls! 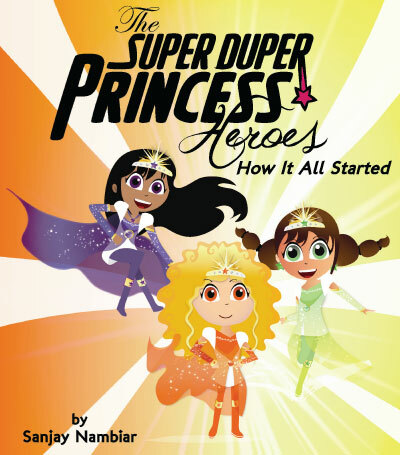 The Super Duper Princess Heroes: How It All Started offers today’s young girls a much better story than “someday my prince will come.” Find it here: http://www.superduperprincessheroes.com. Links to Inner Pieces Gallery book finds are non-affiliate links. They are provided simply for the joy of sharing good books and for supporting the work of inspiring authors. Want to show your support, too? Click a share button at the below.